EXECUTIVE PERSPECTIVE: How did palm oil become such a problem? How did palm oil become such a problem — and what can we do about it? Production of this ubiquitous ingredient is devastating for the environment. Solutions are complex, but they are out there. November 3, 2014 — Last August, from the window of a jet high over Sumatra, I counted nearly a dozen plumes of smoke rising from the vast jungles and plantations below. Some more than a half-mile wide, they looked like pillars holding up the sky. That week the Indonesian Disaster Mitigation Agency detected 143 new wildfires in Riau Province, the area beneath my flight. All of the fires were almost certainly related to deforestation for timber operations and agriculture — predominantly oil palm cultivation. Palm oil — which appears in a dizzying amount of food and cosmetic products and is a feedstock for biofuel — poses many environmental problems. It’s the largest driver of Indonesian deforestation, which destroys habitat and contributes to climate change. And ponds of wastewater at palm oil refineries release immense amounts of methane, a greenhouse gas 34 times more potent than carbon dioxide. Solutions to the environmental problems posed by palm production are complicated, partly because palm oil’s ubiquity, but also because alternatives lack many of the benefits of the versatile oil. But they are out there. A few days after I arrived in Riau, as I marched to the jungle to see one of the fires, I looked back at where my footprints sank some 12 inches into the peat and saw smoke rising from my tracks. It’s here, in the peat burning below the forests, where the greatest climate impact from palm production can be seen. When forests are cleared to make way for oil palm plantations, the area is usually burned, and most of Riau’s massive fires burn on peat — swampy layers of partially decayed vegetation that spreads up to 60 feet deep beneath most of the province’s forests. Fires associated with clearing land for oil palm plantations in the Indonesian province of Riau release massive amounts of carbon into the atmosphere and spread health-harming haze across the landscape. Photo by Aulia Erlangga for Center for International Forestry Research. Peatlands hold up to 28 times as much carbon as rainforests growing on mineral soil. The peat is so carbon rich that if it is buried long enough, say for a million years or so, pressure, time and heat will turn it into coal. A single hectare of peatland rainforest can release 6,000 metric tons of planet-warming carbon dioxide when it’s converted into a plantation. 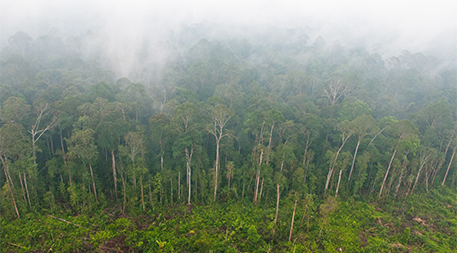 Researchers estimated that in 2012 nearly 70 percent of the carbon released during the transformation of Sumatran rainforests into palm plantations came from peatlands, a 75 percent increase over their portion of emissions in the 1990s and an indication that palm is increasingly expanding into peat. And it’s not just CO2: In 2013 the nation’s then president, Susilo Bambang Yudhoyono, apologized to Singapore and Malaysia for the brown cloud from Sumatran fires that shattered air pollution records in the neighboring nations, filled hospitals with tens of thousands of smoke-sickened patients and forced officials to close schools. Indonesian aircraft seeded clouds above the fires with 100 tons of salt in hopes of bringing rain to drench fires smoldering in the peat. When the forests ignited again six months later, more than 9,000 tweets bombarded the president’s office. During an emergency trip to Riau he said he was “ashamed” of the fires. Nearly 50,000 Sumatrans sought treatment for the impacts of smoke on their lungs, eyes and skin. Aircraft again seeded the clouds. 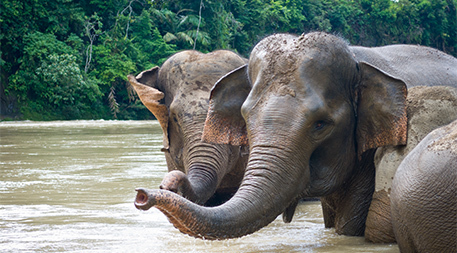 Victims of habitat destruction driven in part by palm oil production, Sumatran elephants are now considered critically endangered by the International Union for Conservation of Nature. Photo by Vincent Poulissen (Flickr/Creative Commons). The fires burn thousands of Indonesians out of their homes and destroy the habitat of endangered elephants, rhinos, tigers and orangutans. A United Nations report warned that no wild orangutans may exist outside protected areas by 2020. And at the current rate of habitat destruction, the International Union for Conservation of Nature estimated the Sumatran elephant could be extinct within 30 years. In the past, Indonesia and the world paid lip service to stopping palm oil industry’s destruction of Indonesian forests and warming of the global climate, but more recently they have appeared to get serious. In 2010 Norway promised $1 billion to Indonesia to keep its forests standing, and the next year Yudhoyono pledged that by 2020, with international assistance, the nation would reduce its greenhouse gas emissions by 41 percent from its “business-as-usual” trajectory. Last August, Singapore began imposing fines of up to $2 million on local and foreign companies that contribute to the haze from fires. The following month, Indonesia, after years of stalling, became the last of the 10 members of the Association of Southeast Asian Nations to ratify a treaty intended to reduce the smoke that has become a perennial strain on its relations with its Southeast Asian neighbors. Shortly afterward, at the U.N. Climate Summit in New York, 150 companies — including McDonalds, Nestlé, and Procter and Gamble — pledged to cut deforestation worldwide in half by 2020 and to eliminate it altogether by 2030. In 2013 the world consumed 55 million metric tons of palm oil, nearly four times what it used 20 years earlier.Then, within days of taking office last October, Indonesia’s new president, Joko Widodo, proposed merging the country’s Ministry of Environment and Ministry of Forestry. That reform could help the nation meet its ambitious forest protection and emissions reductions goals if the Ministry of Environment, which negotiates with the U.N. and determines how the nation will meet its emissions goals, gains some authority over the nation’s forests and peatlands. On the other hand, the powerful and territorial Ministry of Forestry could usurp some of the Ministry of Environment’s authority. “Combining exploitation and conservation authorities into one body does not guarantee balanced decision making,” Greenpeace Indonesia chairman Longgena Ginting told the Jakarta Post. Ultimately, however, laws, treaties, government agencies and incentives will have little impact without fundamental changes to how palm oil is produced and consumed. And unfortunately, there are few viable alternatives to palm. In 2013 the world consumed 55 million metric tons of palm oil, nearly four times what it used 20 years earlier. Indonesia and Malaysia satisfy 85 percent of the demand for the world’s most popular food oil. In 1985, Indonesia had less than 2,500 square miles of palm oil plantations. Twenty years later, they covered 21,621 square miles, and by 2025 the Indonesian government projects plantations will cover at least 100,000 square miles. A month before my arrival in Riau a paper in the journal Nature Climate Change reported that in 2012 Indonesia deforested nearly twice as much land as Brazil, which until recently was destroying its forests faster than any other nation. The exponential growth of palm oil plantations is to a large degree an unintended consequence of economics and food and energy policies elsewhere in the world. “There presently aren’t great alternatives to palm oil.” — Rhett ButlerIn 2006 U.S. food labels, under mandate from the Food and Drug Administration, began listing “trans fats” because they increase risk of heart disease. That led to a rapid increase in the use of tropical oils that aren’t trans fats, particularly palm. The television physician Dr. Oz promoted palm oil’s benefits to the heart and brain, helping drive a sixfold increase in consumption in the United States since 2000. In Europe, efforts to avoid genetically modified foods pushed palm, which is so bountiful it hasn’t yet drawn much interest from genetic tinkerers. In China and India, the growing middle classes’ hunger for high-grade food oils can currently be satisfied only by palm. The boom is fueled by what we drive, too. The increasing interest in biofuels is replacing the environmental damage associated with crude oil with the devastation palm production inflicts on tropical forests and the climate. Some of the consequences of palm oil production, including deforestation and habitat destruction, have led to consumer boycotts. But such actions increase the demand for oil crops that are even more destructive to forests and the climate. As demand for alternatives grows, however, that could change. In fact, one promising alternative oil to palm requires no land at all.The microalgae’s versatility makes them a good competitor with palm as a source of oil. Solazyme, a California company, uses microalgae to produce oils for biodiesel that have already powered United Airlines jets and U.S. Navy ships. It’s expanded into oils for soaps, cosmetics and foods, which have higher profit margins than fuels. Last year consumer products powerhouse Unilever announced plans to use 3 million gallons of Solazyme’s algal oil instead of palm in an effort to lower its environmental impact. Microalgae cultivated by California-based Solazyme show promise as a source of palm oil substitutes. Photo courtesy of Solazyme. 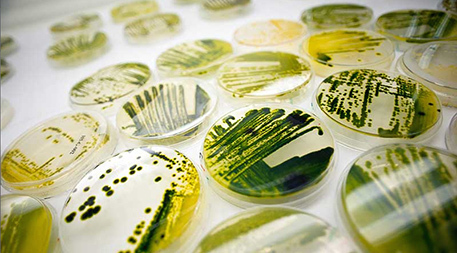 The microalgae’s versatility makes them a good competitor with palm as a source of oil. “Our goal is to try and help alleviate the pressure on the equatorial tropics,” Kauffman Johnson says. Since Solazyme’s algae grow wherever the company places its tanks, Solazyme can site its plants where they are most convenient to customers, partners and feedstocks, thus shortening supply chains. Cellulosic feeds such as switchgrass also minimize environmental impacts. The company just opened a 100,000-metric-ton plant in Brazil that uses sugarcane. “Our technology is capable of ramping up very quickly,” Kauffman Johnson says. Nonetheless, consumer tastes and agricultural economics are slow to embrace algae-based oils, so it will likely take years for these oils to replace more than a few drops in the flood of palm oil. A more immediate solution, Butler says, is cleaning up the palm industry. Philip Taylor, a postdoctoral scholar at the University of Colorado’s Institute of Arctic and Alpine Research who works with Townsend and has done extensive research in the tropics, says most palm plantations don’t produce the yields they are capable of. Yields of palm fruit, Taylor notes, have been stagnant since 1975, while in that same time, soy productivity has improved almost 100 percent. Incentivizing the transfer of productivity-boosting knowledge among palm producers could make each hectare of plantation as productive as possible. But the Union of Concerned Scientists, in its report Recipes for Success, notes that the increased profits that accompany improved yields can spur further expansion of plantations. Additionally, researchers from the UK and Singapore noted in a recent essay in the journal Science that increased yields and palm crops more suitable for growing in difficult conditions could lead to more land in Africa and Latin America being devoted to palm — both of which have yet to see the explosive planting of palm that has occurred in Southeast Asia. Therefore, improved yields must be accompanied by stricter protections of forests. Indonesia has had a ban on deforestation since 2011, but it’s riddled with loopholes. The Roundtable on Sustainable Palm Oil started certifying palm oil that met environmental standards 10 years ago, but many of its members continued to cut down forests. Last summer’s promises to stop the destruction of forests from government, palm producers and companies that use the oil show those efforts are strengthening. “You have to have a moratorium on deforestation,” Taylor says, noting that the recent commitments by companies like Wilmar and Golden Agri to end deforestation is a significant step in the right direction. “These guys are a huge share of the palm industry,” he says. If all of the more than 1,000 palm oil refineries worldwide turned their methane into electricity, it would reduce the climate impacts of the operations 34-fold.At the other end of the production chain, Taylor pointed to more low-hanging fruit for reducing palm oil’s environmental toll. Taylor’s and Townsend’s research shows that the methane released from palm oil refineries accounts for more than one-third of the palm industry’s impact on the climate, and a single pond of palm refinery wastewater annually puts out climate-warming gases equivalent to 22,000 cars. That methane could be used to make electricity by simply covering the pond and placing a biogas generator beside it. If all of the more than 1,000 palm oil refineries worldwide turned their methane into electricity, it would reduce the climate impacts of the operations 34-fold. Yet only 5 percent of the facilities do so. In Indonesia, palm mills and refineries already generate their own electricity by burning the fruit’s solid waste. They’re usually far from the grid, and lack policies and infrastructures to feed the electricity into it. But they could send power to nearby villages. “That’s being done by New Britain Palm and Musim Mas,” Taylor says. Indonesia’s Sustainable Palm Oil initiative requires palm operations to begin developing biogas capture, which should speed more companies’ adoption of the technology. And the hundreds of vehicles involved in the nation’s palm supply chain could burn liquefied natural gas — a transportation fuel that’s seeing rapid development elsewhere in Asia. In Riau Province, I passed neither a road nor an hour that wasn’t filled with bright yellow trucks loaded with scarlet bunches of palm fruit. All of those vehicles could run on a cheap and readily available fuel that would provide additional income to palm processors and mitigate their climate impacts. “It’s going to happen in the next couple of years,” Taylor says. But the coming years will also bring an increasingly ravenous hunger for palm oil. One producer, Asian Plantations, estimates that global demand for edible oils will more than quadruple by 2050. Palm will supply nearly 60 percent of that demand. So perhaps the most important development in the search for palm oil alternatives is the sense of urgency.